The sun has been shining (we missed it!) and now it’s May. Warmth and humidity on the East Coast makes me a happy camper. Our pool is opened and school will be out in a month (it can’t come fast enough!) It’s time for me to get ready for summer’s arrival! Summer is the time where I need to care about my beauty products. Julep sent me a fun surprise filled with all the summer essentials I will need. When it arrived, I couldn’t wait to see what was inside! I’m in sandals so much, I need to have my feet looking better than I allow them to look when no one can see. That means painting my toes in pretty colors. 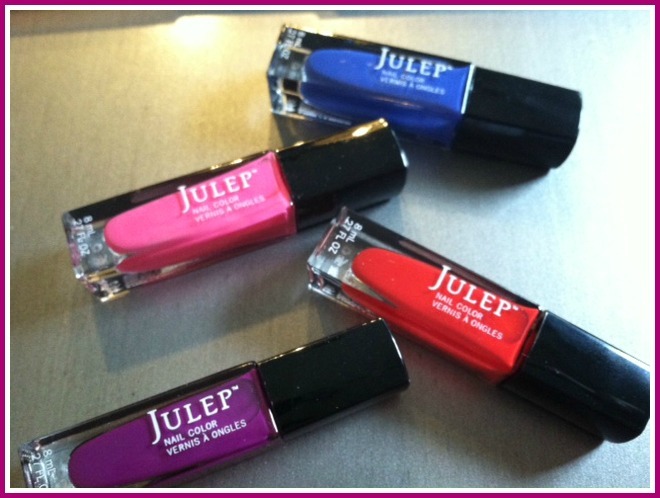 Julep has such gorgeous bright tones for their nail polish. I love the vibrant Julep Color Treat nail polish infused with antioxidants from pure green coffee extract and the oxygen technology that allows nails to breathe. The smooth coverage of the polish is awesome and it is also strengthens nails while you wear it! I can’t stand wearing lipstick, but I do love lip gloss. Julep has incredible lip gloss and I loved each of the colors that they sent. Very natural looking colors. Some even have a fun shimmer in them. Even the gloss that looks very dark red is a beautiful berry color called Posh, that isn’t overly dark when applied. My favorite for everyday is Glowing–it is almost clear when on with a hint of pink and shimmer. The glosses are long lasting and smooth on your lips. Like many women, my hair has a life of it’s own, especially in the humidity. Julep has an awesome product, Sea Salt Texture Spray, which is perfect for me to use in summer. All I have to do is spray it on my damp or even dry hair and scrunch or diffuse my hair for a natural wavy look that ordinarily would only be attained after spending the day at the beach. Makes an awesome look with very little effort. In summertime, especially, low maintenance is what I’m after! After spending some time in the sun, my skin is in need of some TLC. After a shower, applying Beach Tonic, a dry body oil, is heavenly! This lightweight spray can be rubbed into the skin to leave your skin feeling silky smooth and wonderful, without any oily residue. I absolutely adore this product! I also really love the Luxe Repair Skin Serum to rub into my skin. It helps improve skin clarity, reduce the appearance of wrinkles, and post-acne marks. It is so hydrating and soothing to put on my skin. 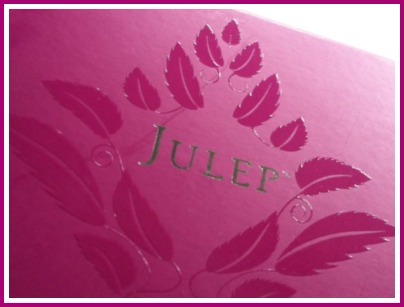 Having never tried Julep’s products before, I was really impressed with the quality of everything I tried. I am a fan now and will most definitely be purchasing more of their great products in the future. Check out Julep’s site to hand pick some beauty products that fit your needs. You will love their products!